Grower/processor panel on the Chinese market. 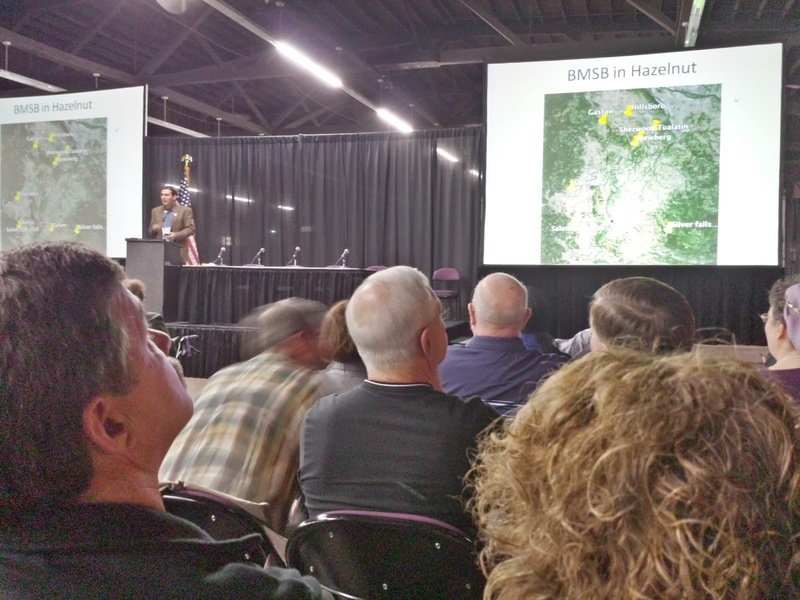 With about 80% of Oregon Hazelnut production going overseas to China growers have been increasingly concerned about the health of that market. Four grower/processors who have been involved with the emerging market gave their perspective on Chinese consumption. 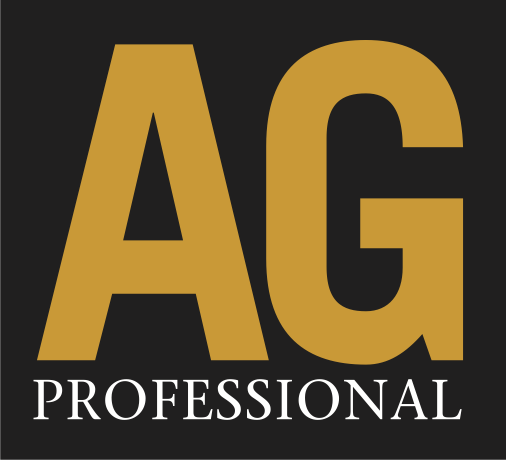 The market has grown both in scope and sophistication in short time. 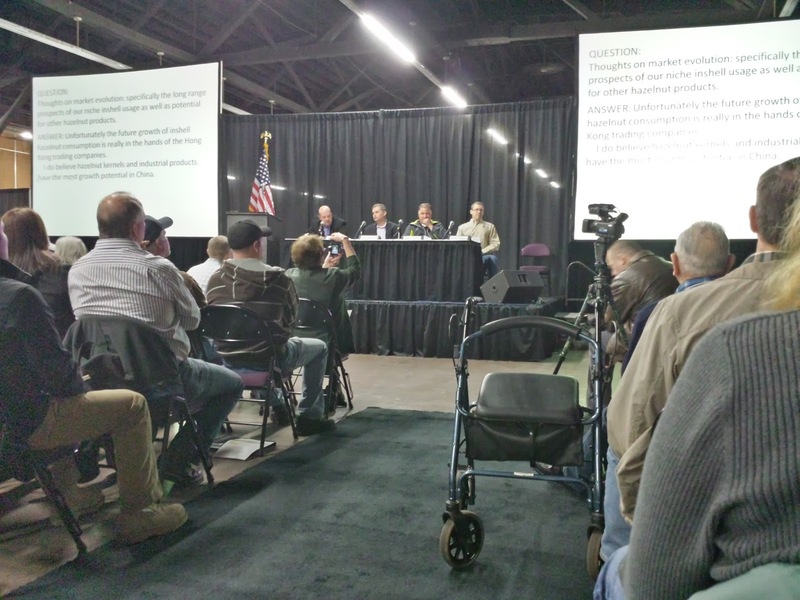 One panelist had an encouraging final word when he told the audience, "World nut consumption is growing by about 4% per year and Oregon produces about 4% of the world's hazelnut supply. 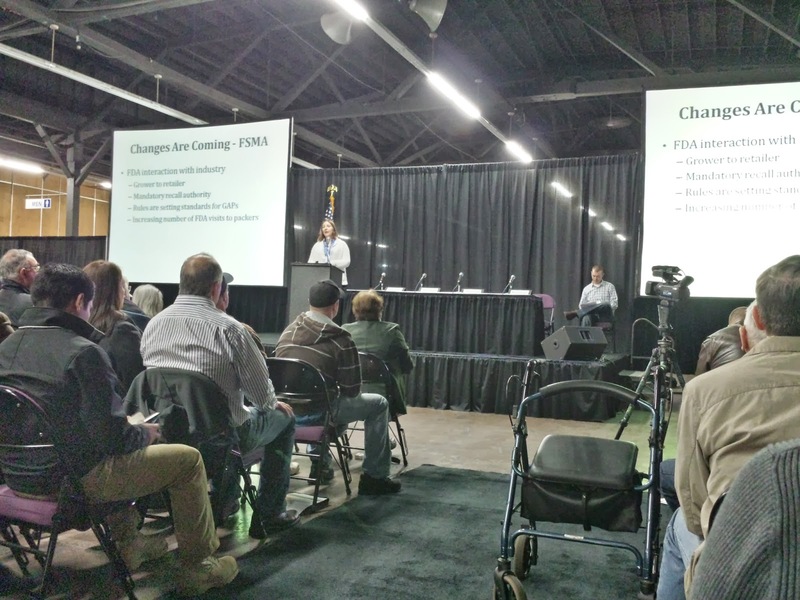 So that means the global demand grows by an entire Oregon crop every year." Oregon production remains the pinnacle of quality so these numbers are encouraging locally. Update on the spread of the Brown Marmorated Stink Bug. OSU Extension Entomologist Vaughn Walton has been following the Brown Marmorated Stink Bug (BMSB), a new invasive pest that has been slowly expanding geographically, for the last couple years. 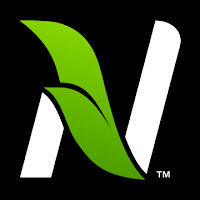 The early season feeding habits cause damage to newly developing nuts that can result in loss of that nut or an ugly, damaged, unmarketable kernel. According to reports we do not have this pest in the South Willamette Valley...yet. Given BMSB mobility the Tangent crew has decided to place traps out this year in orchards throughout the southern Valley hoping to spot this pest before it becomes an economic concern for us down here. 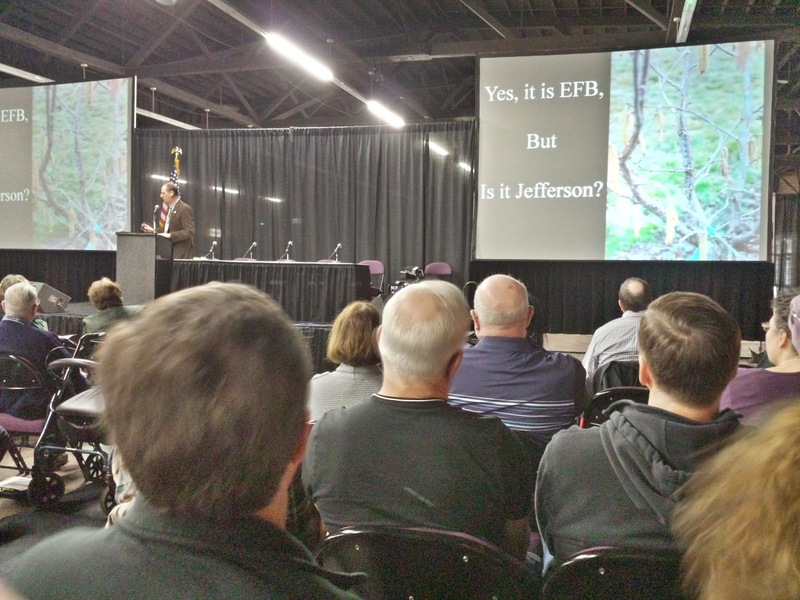 Eastern Filbert Blight (EFB) in the Jefferson variety? The EFB cases in Jeffersons that OSU Extension Pathologist Jay Pscheidt has monitored are interesting. EFB cankers can show up in Jeffersons under SEVERE disease pressure during orchard establishment but the disease does not appear to run rampant in the tree. From Jay's observations the spray programs combined with the genetics in the Jefferson variety squelch the disease after a year or two. Long term observation and updates will be coming as these young orchards age. 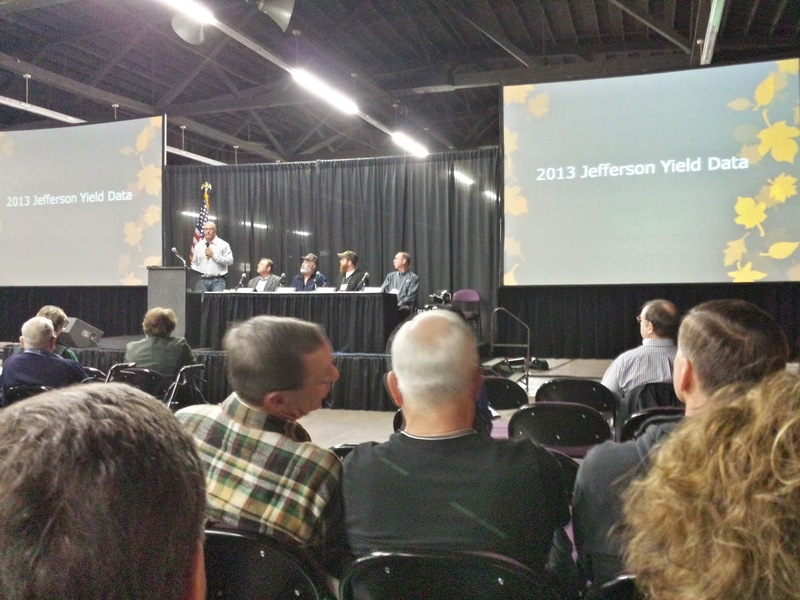 Grower panel discussing yields in young Jefferson orchards. 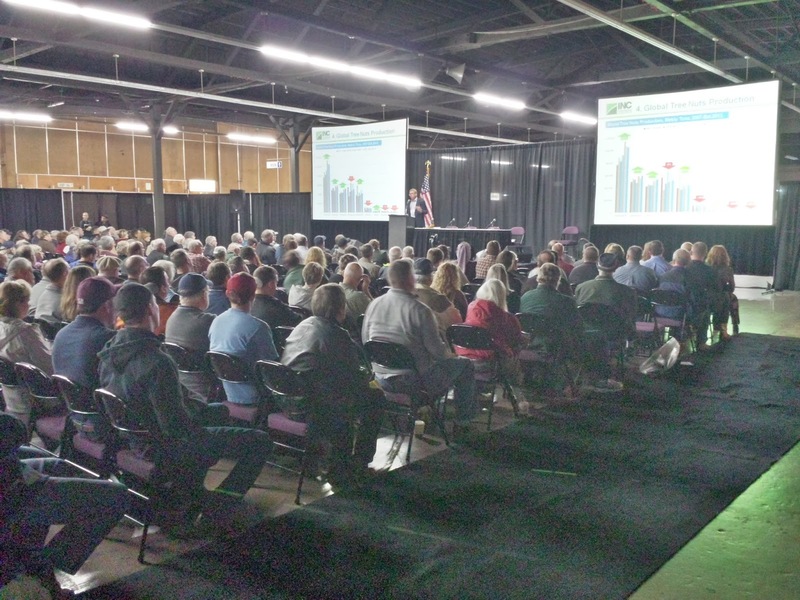 This grower panel discussed yields on 4th, 5th, and 6th leaf Jefferson orchards. Among panelists was South Valley grower Barney Kropf from Harrisburg. Objectives of the Hazelnut Breeding Program at Oregon State. 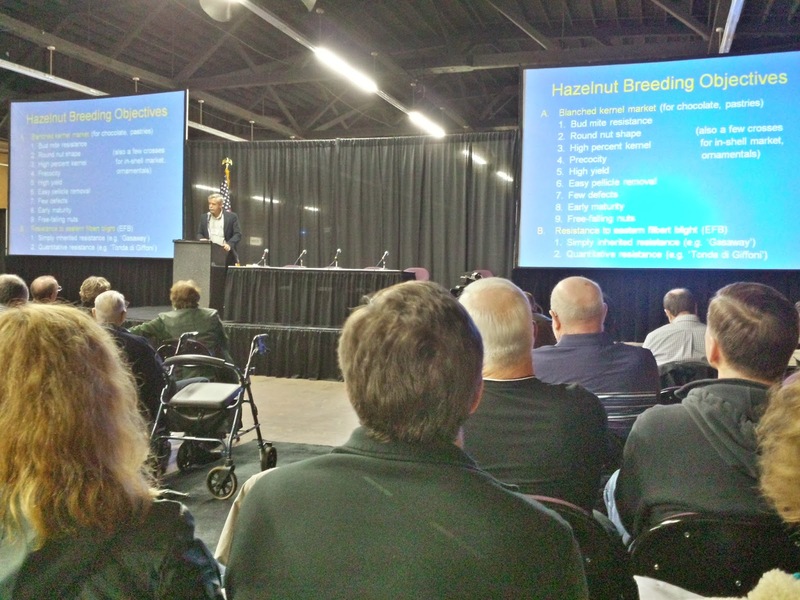 OSU Hazelnut Breeder Shawn Mehlenbacher leads one of the world's top hazelnut breeding programs right here in our own backyard. Disease resistance, yield, quality, and growth habit are among the top objectives of the overall program. The variety officially released in 2014 is named McDonald. This is a moment growers look forward to every year, the official release of the new variety from Mehlenbacher and crew at Oregon State. 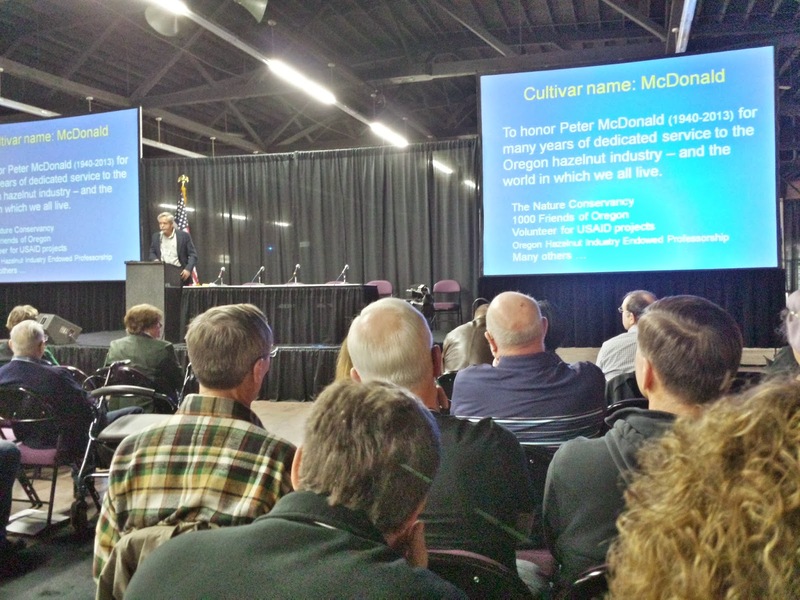 The McDonald name has a long history in the Oregon hazelnut industry. Follow this link to read the Capital Press write-up on the new McDonald variety.